There is another storm cloud approaching for the United States housing market. On October 1, 2011 the extremely relaxed lending guidelines for the FHA, Fannie Mae, and Freddie Mac will begin tightening. These three monsters are now responsible for providing over 97% of the new mortgages created in the US. In higher priced cities the maximum loan amount for Fannie Mae and Freddie Mac jumbo loans will fall from $729,750 to $625,500. In lower priced markets that are currently dominated by FHA insured loans, the maximum limits will also be falling. For example, in Minneapolis the FHA loan limit will fall from $365,000 to around $275,000. For information on your area's loan limits click here. If you want to purchase a home in a comparable city to Minneapolis today for $465,000 you would have to pay a down payment of $100,000. On October 1 you will have to put down $190,000. There are less people in the real estate market that have the ability to put down $190,000 vs. those that have the ability to put down just $100,000. This means a lower supply of buyers (lower demand) on the market. This lower demand will coincide with a surging supply of homes as shadow inventory continues to enter the market. Unless.........the government steps in to relax lending standards further as prices once again begin to plunge. This is a very likely scenario under our now communist regime. 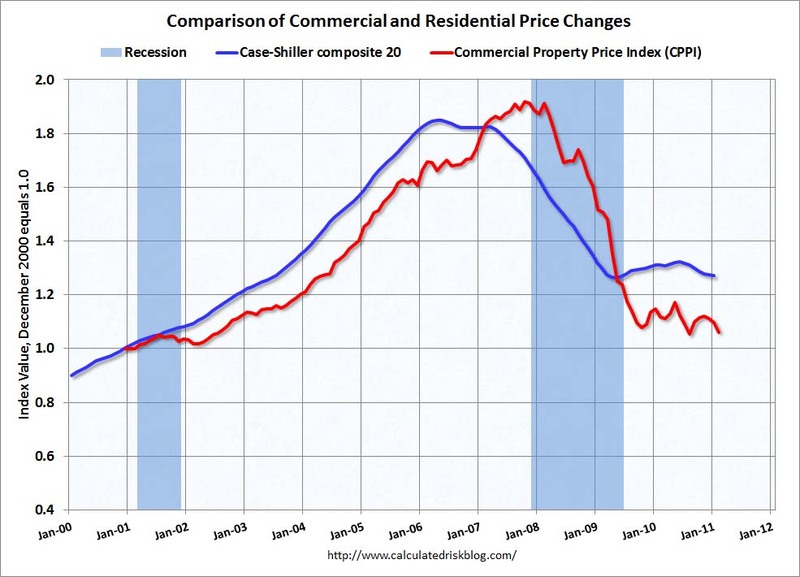 No matter what the government does in terms of trying to artificially keep home prices above the free market clearing level (which would occur if they no longer provided mortgages), real estate priced in gold and silver will continue to fall. While it is tragic to watch what they are doing to our country, those holding precious metals will soon have the opportunity to purchase real estate at rock bottom prices during the final mania stage of this secular bull market. 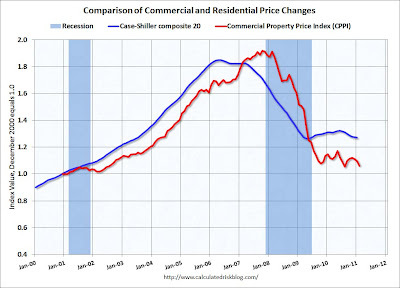 Moody's reported this morning that commercial real estate prices fell 3.3% in the month of February and are now down 44.7% from the peak of the bubble in 2007. Cap rates (the rate paid for real estate income which determines the purchase price) have moved down considerably in relation to10 year treasury bonds (known as the "spread") and some investors are paying close to the same rate of return for commercial real estate as risk free government bonds in places like California. This is complete irrationality in the market and those purchasing today will be slaughtered during the next leg down in prices. This should coincide with the point when banks must finally release their "extend and pretend" non-performing loans sitting on their balance sheets underwater. 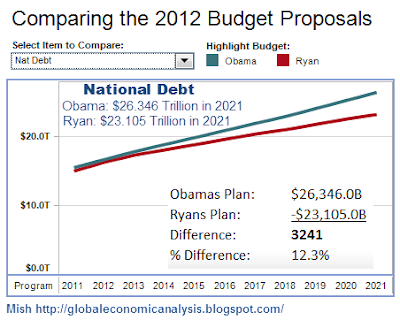 The discussion in the media currently, after all the heated debate over the $38 billion in spending cuts which turned out to be less than $1 billion when looked at closely, is whose budget plan will the US go with over the next decade; Obama or Paul Ryan? Both men have their staff working non-stop to find imaginary cuts they will make in future spending. As they were last week during the $38 billion comedy show, the America people are riveted. 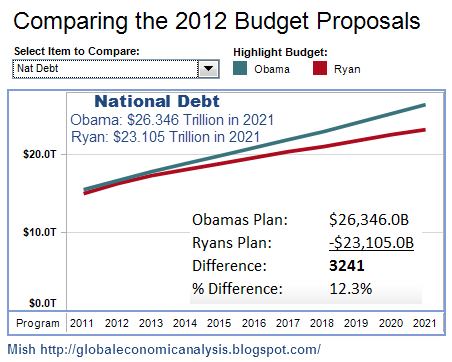 Paul Ryan's is better, but as you can see it does nothing to solve the problem. Both deficits still continue to track upward at a rapid rate. In reality, our revenue is soon to collapse during the next leg down of our current depression, which began in December 2007, and the interest payments have no where to go but up, as our bond market is in the final stages of the largest bubble in history. As Greece is proving today with their government debt approaching 20%, the market can be quite cruel when it turns on you. When revenue plunges, and interest payments on the current $14 trillion we already owe surge, these pie in the sky projections will turn to pixie dust. The truth is that both parties will never get close to the fantasy projections they are putting before us. Spending will continue to surge as the economy continues to crumble because of coming "stimulus" programs to save us. While the games are fun to watch and keep people distracted from what is really happening, the financial markets understand exactly what is taking place behind the curtain. Gold crossed $1,500 this morning and silver is closing in on $45. The dollar index has broken below 74.5 and is now tracking a straight line downward. While just one of these events has the power to create tremors in the market, they are all happening simultaneously. Bernanke continues to pump in his trillions of printed cash to try and offset these deflationary forces, but his ability to overcome the size and magnitude of the force is still in question. This means you have to continue to stay nimble. There will be deflationary shocks (2008), and there will be reflationary rises (today). I continue to believe that the best strategy is to hold strong positions already in place and continue to build cash to purchase during the next shock to the markets. On April 18, 2011, Standard & Poor's Ratings Services affirmed its 'AAA' long-term and 'A-1+' short-term sovereign credit ratings on the United States of America and revised its outlook on the long-term rating to negative from stable. The notion that America still carries a "AAA" rating (the best) is laughable at best. The debt should be rated junk, and it will be before this saga concludes. This is the very first chink in the armor of the pristine credit rating of the United States. As we have seen with countless examples in history, when a bankrupt government's debt collapses (think Greece, Ireland, Portugal) it happens quickly and without warning. It is impossible to know what will trigger the collapse of US debt, the only assurance is that the day is coming. Stocks, bonds, and every asset across the board are getting destroyed on the S&P news. Except gold and silver, which are exploding higher in early trading.